A look at the definition of SCADA, the role of the SCADA system, the evolutions of Supervisory Control and Data Acquisition in the age of cloud and IoT and SCADA system market forecasts until 2022. In our article on Industry 4.0 we briefly touched upon SCADA, short for Supervisory Control and Data Acquisition. SCADA is part of the operational technology landscape but sits close to the IT dimension of the so-called automation pyramid which we tackled in our article on the manufacturing sector and manufacturing technology evolutions. As written in our overview of operational technologies, the scope of OT is mainly to be seen in the monitoring of physical processes and physical devices in a context of control, automation, diagnosis and operational processes. SCADA and the SCADA system play a key role here, more specifically in industrial processes and automation. And just as is the case in operational technologies, Industrial IoT and related technologies such as cloud computing (and soon cognitive computing, edge computing and perhaps even blockchain, if we look at the future of the MES and ERP systems with intelligent ERP) take center stage in the evolutions of SCADA systems whereby some even see the end of SCADA in a distant future (most see IIoT and SCADA as complementary). Supervisory Control and Data Acquisition software monitors, processes and analyzes industrial processes whereby it sits on the production level of Industry 4.0, in-between the process control level of PLCs (programmable logic controllers) where the regulation of machines and systems occurs (control of manufacturing processes) and the operations level (where in manufacturing we, for instance find the Manufacturing Execution System). However, SCADA isn’t just a matter of manufacturing where it serves as the industrial process control system to monitor, control and supervise the product line. SCADA systems traditionally are seen as consisting of various levels beside the software dimension. A Supervisory Control and Data Acquisition system then comprises field instrumentation (instruments to monitor and control automation processes), the mentioned programmable logic controllers and RTUs (Remote Terminal Units), the data communication layer and telemetry (nowadays better known as remote monitoring) and, finally, the SCADA host or SCADA supervisory computer system with the SCADA software or HMI software. When people talk about Supervisory Control and Data Acquisition they often mean the industrial process control software which then essentially collects real-time data from and communicates with the field controllers that run the actual industrial process such as the PLCs and RTUs. Just as is the case with operational technologies in general, SCADA is used in all possible areas where there are industrial processes, ranging from manufacturing, travel and transport, oil and gas, healthcare, water treatment, water distribution and electrical power distribution to facility processes in smart buildings, HVAC (heating, ventilation, and air conditioning), critical power buildings (airports, hospitals,…) and building management processes overall. As Carl Gould, co-director of software engineering at Inductive Automation explains in a video that provides an excellent introduction to SCADA, Supervisory Control and Data Acquisition systems, which are effectively used for controlling, processing and monitoring industrial processes, are also used in wastewater systems, petrochemical systems, food and beverage, utilities and far more. In other words: the list is long. As is the case with all operational technologies, building automation technologies and manufacturing technologies, the SCADA market, which goes back to the days of minicomputers, has been evolving throughout the years, hand in hand with the various evolutions in information technologies. In general, four generations of Supervisory Control and Data Acquisition systems are defined. It probably won’t come as a surprise that in the current fourth, generation, IoT and Industrial IoT as said play a major role. Despite being around since quite some time the SCADA market shows growth in this evolving context with drivers such as the ever more important need for high uptime in manufacturing, smart supply chains, maintenance and asset management and Industry 4.0 goals overall, the need for higher operational efficiency, the ease of controlling and monitoring of industrial processes and superior quality & quantity. These are some of the main drivers of the SCADA market as found in research that offers forecasts with regards to the SCADA market until 2022. According to the announcement of the report (November 16, 2017) the worldwide SCADA market is poised to grow at a compound annual growth rate or CAGR of 5.01 percent until 2022. It might not be the kind of double-digit or even triple-digit CAGR that we see in some other industrial markets but with a forecasted total SCADA market revenue of US$15.373 billion by 2022 (revenue in 2017 totalled US$12.041 billion) the SCADA market is not exactly the smallest. By way of comparison and as IoT (and cloud) play such a role in fourth generation SCADA systems: total revenue of the IoT platform market in 2018 (which is about to explode in 2019-2020 but already is hot now) will be approximately $3.0 billion. The mentioned SCADA market research announcement also contains a SCADA definition: “SCADA (Supervisory Control and Data Acquisition) is used to gather and analyze real-time data and comprises of remote terminal units, programmable logic controller, telemetry, and Human Machine interface”. On top of the previously mentioned SCADA market drivers also the high investments in infrastructure for various sectors and high potential from the renewable energy sector are poised to add to the growth of the industry. The latter again shows how energy-efficient technologies in buildings and energy efficiency in general rank high on the agenda of industries in the broader scope of ecology and technologies and sustainability. Throughout the many evolutions of SCADA systems a pretty constant challenge has existed on the level of security. In fact, we should again add that this isn’t just the case for SCADA but for many operation technologies. Especially when Supervisory Control and Data Acquisition systems entered the second (distributed, with local area networks), third (networked, with often geographically spread process control networks, leveraging more than one local area network) and now fourth generation (cloud, IoT and interfacing with data modelling and what we could call digital twins), that security aspect became even more important, especially the cybersecurity aspect. However, SCADA security was already a security in the early days as in the end when you talk about power systems, oil and gas and so forth by definition you speak about mission-critical, yet decentralized facilities, including things like gas pipelines and energy grids. Moreover, SCADA systems by definition are often leveraged for the control of geographically dispersed field controllers that can span huge areas. These kinds of environments were connected by SCADA systems which were designed by engineers to be solid and robust and not from a security perspective as we understand it in IT and in today’s hyper-connected context. Once more we need to add that this is an issue with regards to OT and the integration of IT and OT as well. Despite evolutions with regards to SCADA security, the previously mentioned report states that even at the end of 2017 the cybersecurity threat remains the major restraining factor. One of the major challenges with regards to the overall security of SCADA systems, the human-machine interface (HMI) seems to be the weakest link as reported by Trend Micro in its SCADA/HMI security report. And of course then we are talking about SCADA/HMI software. Can be used to create charts, run reports and that way enable operators of industrial processes not just to see what happens now but also in the past and in the future with predictive capabilities.And there you have it: data (including metadata from PLC register paths and alarm analytics as this introduction article on SCADA systems on All About Circuits by Donald Krambeck reminds us) in the scope of industrial processes with an increasing importance of IoT and IT. The image below from the article gives an idea of a basic Supervisory Control and Data Acquisition system set up. Also the people of Inductive Automation have a very good overview of what SCADA is with loads of information on the basics, usage, roots and evolutions of SCADA and Supervisory Control and Data Acquisition systems as they are. However, do remember that IoT is playing an increasing role which, among others, is translated in the support of typical IoT devices, systems and protocols on top of database, OT protocols and plenty of others (the systems connect with database systems, they don’t “have” one). B-Scada, which also has an IoT platform (the Status Device Cloud IoT Platform) and a smart city solution (the CitiWorx Sensing Platform) for example offers machine-level HMI software and a Supervisory Control and Data Acquisition system software solution offering data connectivity ‘for thousands of devices and systems”, such as OPC UA, OPC DA, SNMP, MQTT, REST, Bar Code, GPS, Domoticz, Empress, SQL and ODBC data sources, Excel workbooks, Allen Bradley, BACnet, Modbus and Siemens S7 devices, as well as Monnit, Libelium, Advantech Wzzard, and B-Scada sensors. Custom data sources can also be supported. 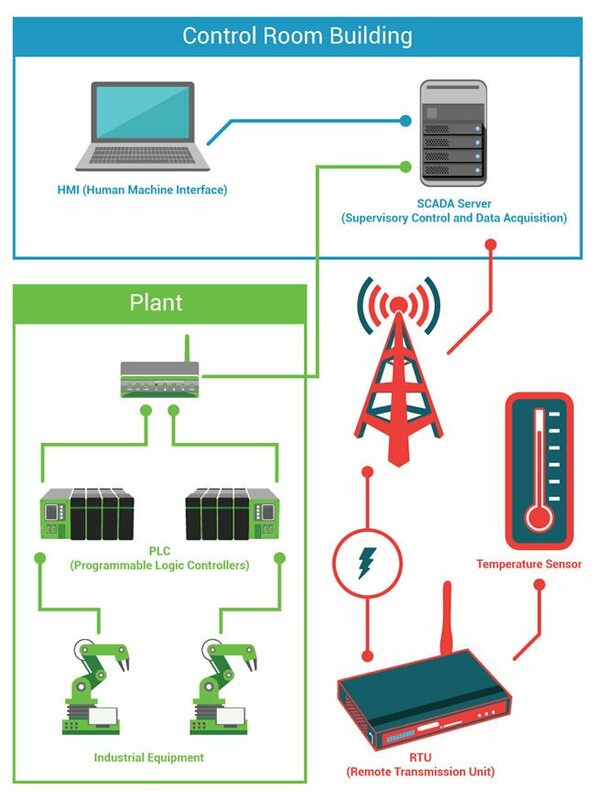 Below is another depiction of a basic SCADA Architecture as featured on the mentioned overview page from the people at Inductive Automation. To conclude a word in the scope of the digital transformation of manufacturing, IIoT, cyber-physical systems, the Internet of Things in manufacturing, Industrial Internet, Industry 4.0, industrial automation and all the other terms we use nowaday. In the previously mentioned article on the need to reexamine the role of SCADA in digital manufacturing operations and the digital and smart factory overall, Alan Cone from Siemens sees five areas where modern SCADA systems like the company’s WinCC add value to a functioniing digitalized plant. For now we close with the words of Cone who states that as a manufacturer works to modernize a plant with digitalization being a competitive manufacturing advantage, adding a SCADA system is a critical first step in establishing interoperability. And of course the advantages of interoperability help in enabling a more competitive manufacturing environment with major benefits being that 1) plant and IT systems begin to communicate (including a more direct exchange that can take place as plant-level functions connect with management platforms such as the MES, ERP and soon intelligent ERP), 2) decisions to optimize plant processes can happen quicker (and soon in a more autonomous way as AI is making its way in the future factory and also the intelligent ERP), 3) energy savings, 4) improved production uptime and 5) synergistic improvement. Top image: Shutterstock – Copyright: genkur – SCADA quote image: Shutterstock – Copyright: AlexLMX – All other images are the property of their respective mentioned owners.